Why go to all the trouble of placing lots of mosaic tesserae if you can just put down tiles that give the appearence of mosaic? It was first used in medieval times, when a tile would be scored with lines to make it look as though it was made up of a number of pieces, and was revived in the Victorian era. In the 1860s, the firm Maw and Company took out a patent on a process for producing pseudo mosaic tiles. The method involved making a tile with grooves - these were then filled with cement, to look like grout. 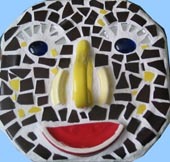 Most mosaics are made of many small pieces (tesserae) which create a design. The overall effect depends on the colours, sizes, shapes, and arrangement of the pieces, and on the spaces between them (the interstices, or grouting joints). Opus sectile is a technique where, instead of having lots of individual tesserae, shapes in a picture are made from larger, specially cut pieces, usually of tile or stone. It is a practice that goes back to ancient Greece and Rome. 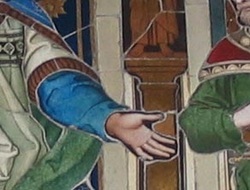 These panels had the durability of mosaic, but the painting allowed more detail to be shown in a smaller space. This meant that they could be used where they would be seen close to, or where a life-like portrait was wanted of a particular person. Traditional mosaic was often combined with opus sectile. In this picture of an angel in Winchester Cathedral, red, black, white and gold mosaic glass tiles have been used for the background and border. There are also shaped pieces of mother-of-pearl forming the angel's halo, in a manner more like ancient opus sectile work. There's a place for opus sectile in modern mosaic too. In these examples a heart shaped from a single tile contrasts with the fragmented background, while the smile on the right is all the more bold for being formed of a single piece of ceramic.